London. European bank shares stumbled towards their biggest daily fall for four years on Monday, led by big lenders in Italy, Spain and France, after Greece closed its banks and imposed capital controls as it faced the prospect of leaving the eurozone. Greece plans to hold a referendum next Sunday on the terms of a bailout plan from creditors, which prompted the European Central Bank to freeze the amount of emergency cash it would provide to Greek banks. 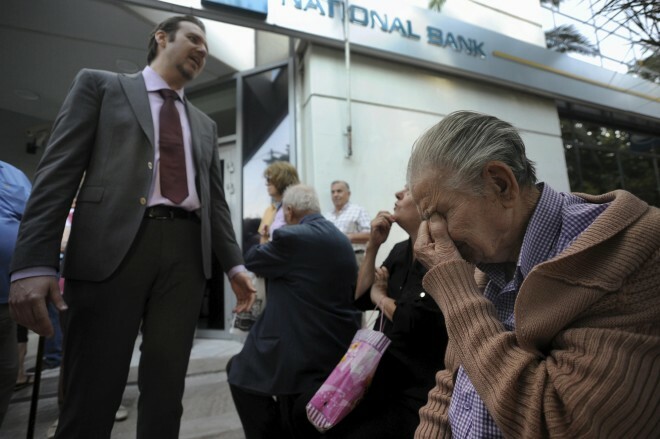 “This weekend’s developments have materially increased the risk profile of Greek banks,” said Ronit Ghose, analyst at Citi. The threat that Greece’s problems could spill over to other parts of Europe raises risks for banks in other peripheral euro zone countries and spooked investors. By 0745 GMT the Stoxx Europe 600 banks index was down 3.9 percent at 214.2 points. The move reversed gains made last week, when there was increased optimism Greece would resolve its problems. The decline put the index on course for its biggest daily fall since August 2011, when fears that a eurozone debt crisis was spreading. Shares in Italy’s Unicredit and Intesa Sanpaolo initially fell more than 7 percent and then traded down 5 percent. Spain’s Santander and BBVA, France’s BNP Paribas and Societe Generale and Germany’s Deutsche Bank all lost 5 percent or more. The exposure of overseas banks to Greece is relatively modest, after lenders, notably those from France and Germany, sold businesses and scaled back their Greek assets in the past four years. The impact of capital controls or a possible Greek exit from the eurozone, dubbed “Grexit”, will be far less than it would have been two years ago, bankers said. But there is concern that an exit by Greece causes a ripple effect into Italy, Spain or Portugal, potentially driving up borrowing costs for governments and companies. The fallout could also halt Europe’s tentative economic recovery. “Unlike 2010, the eurozone banking system is much better insulated from possible contagion following the latest negative developments in Greece,” said Neil Dwane, Europe chief investment officer, equity, at Allianz Global Investors. “Nevertheless, we would expect a markdown of EZ (eurozone) banks in particular as they have been recent strong performers and clear beneficiaries of the rather simplistic ‘Europe is recovering’ reflation trade,” he said. Overseas banks had $47 billion of loans to Greece at the end of last year, down from $138 billion in early 2011, according to data from the Bank for International Settlements (BIS). HSBC had $6 billion exposure to Greece, the most exposed foreign bank, but it said that consisted of $2 billion of reverse repo agreements with banks and $4 billion of loans, half of which were to the shipping industry and denominated in U.S. dollars and booked in London, making it less sensitive to the Greek economy. Its shares were down 2.7 percent. This entry was posted in Business Strategy and tagged Banks, Europe, Greece. Bookmark the permalink. Thanks a lot for your great compliment. Yes, I hope everyone share all of experiences on daily life. Please continue to read, comment, and share this website on daily basis.